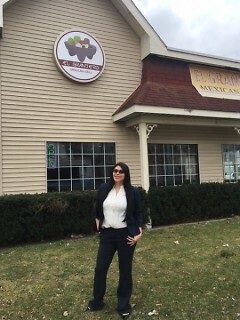 Paola Mendivil outside El Granjero in Grand Rapids. Born and raised in Mexico City, Paola Mendivil came to Tijuana, Baja California when she was 12. She attended high school there before dropping out. At age 17, her family came to Grand Rapids. “I was 17 and for me that was like a second chance to go back to school.” Mendivil attended Union High School for two years and graduated in 2007. When she graduated, Mendivil wasn’t very involved in the community. In fact, she thought she would return to Mexico. But after graduating high school, Mendivil received a scholarship to attend Grand Rapids Community College. Although she may have doubted herself, she knew people were watching her and looking at her as an example. She knew friends that didn’t have the same opportunity that she did. “I said, I cannot give up and say I’m going back to Mexico,” Mendivil said. She accepted the scholarship and attended GRCC for three years. She graduated with an associate’s degree in business administration in 2010. In the fall of 2007, Mendivil’s mother, Mercedes Lopez, was working at then called El Ganadero restaurant on the Westside. The owner at the time decided he was going to close the restaurant. Lopez secured a loan and changed the name of the restaurant to El Granjero Mexican Grill. The restaurant opened October 1, 2007 and will celebrate its tenth anniversary this October. Mendivil worked at the West Michigan Hispanic Chamber of Commerce for six years, where she began as an intern. She helped create a business directory for all chamber members. The plan was always for Mendivil to go back to school. In Fall 2014, she enrolled at Ferris State University. For the past two and a half years, Mendivil has been pursuing her degree. She's now in her final semester. On May 6, she will graduate with a bachelors in business administration. Over time, her committment and involvement with the community has blossomed. She was also secretary for the Latino Community Coalition for two years. In addition, she has served as a board member for GROW, a non-profit women's business center that provides business training and counseling, networking opportunities, and financial resources. Her term ended in December, giving her more time to focus on completing her degree. Mendivil is catering coordinator at El Granjero. She is a member of the Racial Equity Cohort. Recently, she helped develop a civic action plan for Grand Valley State University for the Westside. 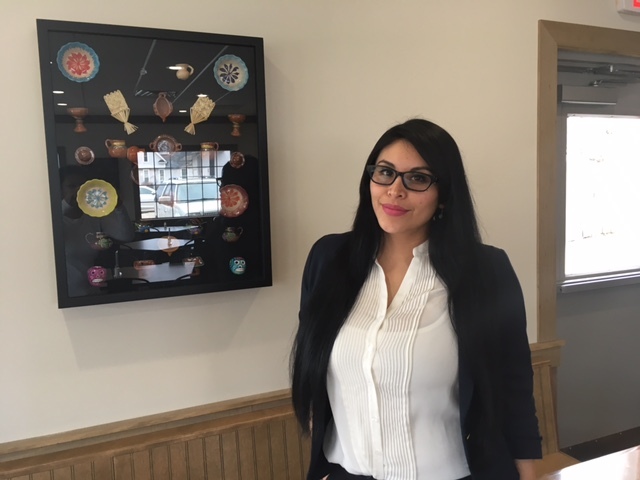 After she graduates, Mendivil wants to deepen her involvement with the Latina Network of West Michigan. “We are a small group that meets and elevates and empowers Latinas,” she said. In January 2016, Mendivil wrote her first piece for The Rapidian. Inspired to respond to a marketing video created by Experience GR, Mendivil took issue with the lack of neighborhood diversity represented in the video. The piece created conversation and dialogue around the important issues of diversity and inclusion. In the fall of 2016, Mendivil wrote a follow up story for The Rapidian featuring a new video created by members of the Roosevelt Park neighborhood, in partnership with Roosevelt Park Neighborhood Association, Grandville Avenue Business Association and Habitat for Humanity Kent County. The video debuted on The Rapidian. For Mendivil, The Rapidian acts as a way to broaden the conversation to include more community members. “It embraces that obligation that if you want to get involved, make your voice heard, then you can do something about it." Most recently, Mendivil wrote a reflection on joining the national "A Day Without Immigrants" movement. She believes the piece will have a lasting impact on the conversation.